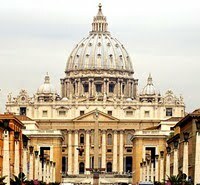 Origin, History of Roman Catholic Church's Art Collection of Painting, Sculpture and Antiquities. it one of the world's best art museums. The Vatican Museums (Musei Vaticani), inside the Vatican City, Rome, are home to the huge art collection of Christian art gathered over the centuries by the Roman Catholic Church. Among the finest art museums in Europe, they contain some of the world's greatest examples of painting, sculpture, tapestry and other decorative arts. Visited annually by over 4 million visitors, the Vatican Museums include 54 separate galleries, including some of the finest High Renaissance art in the Sistine Chapel frescoes, with its Genesis and Last Judgment frescoes painted by Michelangelo, and the Raphael Rooms, decorated by Raphael. Other monumental rooms include the Chapel of Beato Angelico, and the Borgia Apartment. Also part of the Vatican museum complex is a scientific research laboratory and a specialist workshop for the preservation and restoration of paintings, sculptures, tapestries and other objects. The Vatican Museums are open for the summer every weekday morning and in the early afternoon. On the last Sunday of every month, admission fees are waived and entry is free. The museum entrance is on Viale Vaticano, close to the Piazza Risorgimento. More than five hundred years old, the Vatican Museums trace their origin to a group of sculptures collected by Pope Julius II (1503-1513) (including the famous Laocoon and His Sons) and first displayed to the public in 1506, in the Vatican's Cortile Ottagono. However, the Roman Church - the No 1 patron of Catholic art for most of the 15th, 16th, 17th and 18th centuries - and its collection of paintings, sculptures, tapestries and other precious objects, was amassed by many different pontiffs, including, notably: Pope Sixtus IV (1471-84), Pope Julius II (1503-13), Pope Leo X (1513-21), and Pope Paul III (1534-45) during the main period of the Renaissance in Rome. The Sistine Chapel and the Stanze di Raffaello were established by Sixtus IV and Julius II, during the early 16th century, while their successors Leo X and Paul III further developed both the Vatican collection and the artistic and architectural image of Rome itself, with projects such as the new St Peter's Basilica, to replace the old Constantinian church. Other old museums in the Vatican include the Chapel of Nicholas V (1447-1455), frescoed by Fra Angelico (1395-1455) during the last years of Pope Nicholas V; the Borgia Apartment, where Pope Alexander VI lived until his death (1492-1503); the Tapestry Gallery, with its assembly of 15th and 17th century tapestries; the Sobieski Room and the Room of the Immaculate Conception; the Gallery of Maps, established under Pope Gregory XIII (1572-1585) and enhanced by Pope Urban VIII (1623-1644). The present Vatican Museums are a loose group of separate pontifical museums, galleries and rooms that were initially organized in the second half of the 18th century under the patronage of Pope Clement XIV (1769-1774) and Pope Pius VI (1775-1799), whose joint roles are commemorated by the Pio-Clementine Museum. In the 19th-century, Pope Pius VII (1800-1823) significantly enlarged the collections of Classical Antiquities, which he augmented with the Chiaromonti Museum and the Braccio Nuovo gallery. Pius VII also enhanced the Epigraphic Collection in the Lapidary Gallery. Under Pope Gregory XVI (1831-1846), the Etruscan Museum (1837) was opened with archaeological exhibits from excavations in southern Etruria. Gregory XVI also founded the Egyptian Museum (1839), which displays artifacts from excavations in Egypt, along with other pieces from the Lateran Profane Museum (1844), which houses mosaics, statues, bas-relief sculptures and figurines dating from the Roman era. The Lateran Profane Museum was extended in 1854 when it took over the collection of the Pio Christian Museum, which contained a range of ancient sculptures and Christian sarcophagi. Under Pope Pius X (1903-1914), the Hebrew Lapidary was founded in 1910. Its exhibits include 137 inscriptions from antique Hebrew cemeteries in Rome. During the pontificate of Pope John XXIII (1958-1963), the Gregorian Profane Museum, Pio Christian Museum and the Hebrew Lapidary were moved from the Lateran Palace to their present building within the Vatican. The Vatican Pinacoteca museum was commissioned and opened (1931) under Pope Pius IX (1922-1939) in order to showcase paintings collected by Pope Pius VI (1775-1799) and his successors. In recent times, a permanent collection of Modern and Contemporary Religious Art was established by Pope Paul VI (1963-1978) in the Borgia Apartment, in 1973. In the same year, Paul VI founded the Vatican Historical Museum, to accomodate a series of papal portraits plus a range of historic ceremonial objects. In 1987, this museum was moved to the Papal Apartment in the Lateran Palace. In 2000, the Vatican Museums unveiled its grand new entrance hall, and visitor information facilities, along with a number of new artworks specially commissioned for the area. The Pinacoteca building, designed by the architect Beltrami, adjoins the Museum complex by the entrance of the Quattro Cancelli. Many of its works of art were stolen by Napoleon in 1797, but eventually returned to Rome after the Congress of Vienna (1815). The works, spanning the period from the medieval Gothic era to the 19th century are arranged in chronological order, in 18 rooms. Features painting from the 12th, 13th and 14th centuries, by artists known as primitives, because they pre-date Giotto. The wooden panel paintings are noted for their golden Byzantine art-style background, lack of perspective and two-dimensional character. Commemorates 14th century painters from Siena, and Giotto (1267-1337). Important works include Christ before Pilate by Pietro Lorenzetti (1280/1285-1348); The Redeemer Conferring a Blessing by Simone Martini (1284-1344); and Giotto's Stefaneschi Triptych. Displays paintings from the early Renaissance in Florence, characterized by its new perspective and "depth" in the picture-plane. Notable works include The Madonna and Child, with St Dominic and St Catherine, a small tempera painting on wood by Fra Angelico. Features works by the early Renaissance Emilia-born painter, Melozzo da Forli (1438-1494). Contains 15th century paintings. Themes include ancient ruins and past architectures. Exhibits polyptychs by 15th century artists. Highlights the Umbrian School of painting with works by Perugino (1446-1524) and Giovanni Santi (d.1494), the father of Raffaelo Santi (Raphael, 1483-1520), among others. Featuring some of the greatest Renaissance paintings, exhibits here include: a tapestry of the Last Supper, woven from the painting by Leonardo da Vinci (1452-1519), 16th century Flemish tapestries woven from cartoons by Raphael. Several paintings by Raphael occupy the centre of the room, including the Crowning of the Virgin (1502-1503), the Madonna of Foligno (1511-1512) and the Transfiguration (1518-1520). Features St Jerome (1482) by Leonardo, and Lamentation over the Dead Christ by Venetian Giovanni Bellini (1430-1516), among other paintings. Has works by outstanding 16th century painters of the late Renaissance in Venice, such as Titian (1490-1576), Paolo Veronese (1528-1588) and others. Contains late 16th century paintings by Giorgio Vasari (1511-74), Ludovico Carracci (1555-1619), and Federico Barocci (1526-1612). Features canvases by early 17th century painters like: Domenichino (1581-1641), Guido Reni (1575-1642), Caravaggio (1571-1610) and Nicolas Poussin (1594-1665). Has paintings by the Flemish portraitist Anthony Van Dyck (1599-1641), the Italian Pietro Berrettini da Cortona (1596-1669) and Nicolas Poussin (1594-1665). Displays genre-paintings from the 17th century. Displays genre-paintings from the 18th century. Features works by the Bohemian painter Wenzel Peter (1745-1829). Contains various clay models of statues by the great baroque sculptor Giovanni Bernini (1598-1680). Displays a collection of Greek Icons dating back to the 15th century. Designed by the architect Donato Bramante under Pope Julius II, the project was taken over by Raphael who also painted the frescoes on the second level. Raphael's assistant Giulio Romano, aided by Giovanni da Udine and Perin del Vaga executed the frescoes on the first and third floors. Contains original Greek art, along with Roman copies and sculptures dating from c.50-250 CE, including the famous group Athena and Marsyas, a copy of a Greek original by Myron (c.450 BCE). Other exhibits include religious art from Catholic missions throughout the world, like the Altar of Confucius and the Shintoist Temple of Nara, as well as Buddhist statues, artifacts and examples of goldsmithing from Islamic culture, Central Africa, Mexico, and Nicaragua. Opened in 1837, the museum features vases, small bronze sculptures and other archeological findings from Etruria, along with a number of Hellenistic vases and some Roman antiquities. Further rooms showcase the Regolini-Galassi tomb and a wide range of Etruscan gold jewellery and other metalwork. The Sobieski Room, named after the monumental painting by the Polish artist Jean Matejko (1838-1893), depicting Polish King Sobieski's 1683 victory over the Turks, also has a number of 19th century works. The Room of the Immaculate Conception houses a large bookcase of books gifted to Pius IX (1846-1878) by kings, bishops, cities and dioceses, following the promulgation of the Immaculate Conception. For information about the architecture and fine art of this wonderful chapel, see: Sistine Chapel Frescoes. Established by Pius VII Chiaramonti (1800-1823) to house a collection of Roman statues and portrait busts, the display includes almost a thousand sculptures, including portraits of Emperors and gods, friezes and reliefs of sarcophagi from the early Christian art period (150-500). Notable works include a statue of Augustus; a Roman copy of the Doryphorus from an original by the Greek sculptor Polykleitos (440 BCE); and the statue of Nile. Contains tapestry masterpieces created during the papacy of Clement VII (1523-1534) by Flemish weavers in Brussels, according to drawings provided by Raphaels pupils. Named after the 40 maps of Italy and the papal lands, frescoed on the walls between 1580 and 1585. Houses the Vatican's most important Greek and Roman antiquities, including works and copies of works by Lysippos (c.395-305), Praxiteles (Active 375-335), Apollonius, and others. Comprising a gallery, two small rooms and a chapel, the apartment was originally built for Pope Pius V (1566-1572) and decorated by Giorgio Vasari and Federico Zuccari. It also features several Flemish tapestry works dating from the 15th and 16th century. One of the two small rooms houses an assembly of medieval and Renaissance ceramics; the other features a collection of very small pieces of mosaic art, created in Rome during the period c.1790-1850. Originally a private section of the Vatican which was built for Alexander VI (1492-1503), most of its rooms are now home to the Vatican's Collection of Modern and Contemporary Religious Art, consisting of some 600 works of painting, sculpture and graphic art: many of which were donated by contemporary Italian and foreign artists. Highlights include works by Paul Gaugin, Marc Chagall, Paul Klee and Wassily Kandinsky. For a short guide to the Stanze di Raffaello, which includes: the Room of the Signature (Stanza della Segnatura), the Room of Heliodorus (Stanza di Eliodoro), the Room of the Borgo Fire (Stanza dell'incendio del Borgo), and the Room of Constantine (Sala di Costantino).